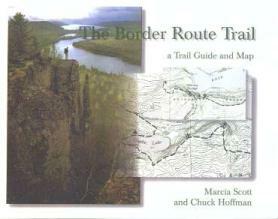 M. Scott, C. Hoffman, "The Border Route Trail, a Trail Guide and Map", 42 pages, 7 maps, spiral bound, 8½" x 11"
The "Border Route Trail Guide" is indispensable for the aspiring Border Route Hiker. It contains detailed topographic maps, locations of camp sites (campsite descriptions are provided on this website on the campsites page) and provides historic context to an area that has seen everything from Voyageurs to logging and mining operations. The trail guide goes beyond a mere description of the trail by pointing out side-trips, both off- and on-trail, to scenery and natural features easily missed. You can view the Table of Contents for details of the trail guide contents. Midwest Mountaineering, 309 Cedar Ave, Minneapolis, MN 55454. Superior Hiking Trail Assoc, 731 7th Ave, Two Harbors, MN 55616. Heston's Resort (North Gunflint Trail). Lake States Interpretive Association, 3131 Hwy 53, International Falls, MN 56649. The distances from Grand Marais were updated to reflect the changes in the Gunflint Trail that now intersects HWY 61 at the northeast end of town. The distances given in the guide are measured from where 5th Street intersects with HWY 61, which is the historical beginning of the Gunflint Trail. If you start up the Gunflint Trail from the northeast end of town, add 0.3 miles to the distances listed. On pages 7 to 9, more detailed information is given on the trails and roads used to access the BRT. Note 2: On page 23 there is an incorrect reference to Canada’s Quetico Provincial Park, the eastern border of which is about 7 miles northwest of the west end of Gunflint Lake. 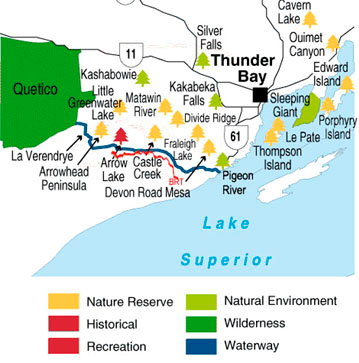 If you follow this link to the Ontario Parks web site, you will see the following map of the area directly north of the Border Route Trail. The BRT is overlaid in red on the map below, but does not appear on the linked page. On that page, you can click on the tree symbols to get information on each of the areas in the section of the Ontario Parks.